outstanding service and 18 holes of magnificent golf. The Olde Point Country Club was built in 1974 and opened to the public in 1975. Jerry Turner, the golf course designer, made use of the rolling terrain, wooded areas, lakes and streams to build a scenic and challenging course. Olde Point has matured into a beautiful 18 hole course with Bermuda fairways and Paspalum greens. 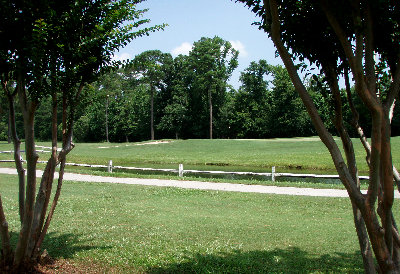 The golf course is semi-private, and therefore open for the public to play. Tournaments and small group outings are always welcomed. Our members enjoy advanced tee times and established league play, as well as a variety of member outings throughout the year. Full golf memberships include the use of the swimming pool. tennis courts and golf course. Practice facilities are also available and open for the public to use. Golf lessons are available by appointment from the club professionals. Collared shirts are required to play a round of golf. Tank tops, gym shorts or bathing suits are not permitted on the course or practic facilities. Blue jeans and denim slacks may be worn if clean and neat.